Please take note that Amazon has just launched an upgrade of its Fire operating system to Fire OS 3.1 which has better integration for its Goodreads. Don’t forget to upgrade your OS and try out the new Second Screen which is similar to Chromecast’s mirroring of content to your TV. Pround owners of the Kindle Fire can now stream videos and TV shows from their tablets right onto the TV! However, you’ll still need to double-check on the format or type of your video files so that it’s compatible to be playback on your Kindle Fire before using the Second Screen. We’ve written this article to save you time in researching it one by one. Check out for more details right HERE. As listed out in Part 1, you can only playback a limited choice of video files on your Kindle Fire. However, you will be able to watch much more (i.e. AVI, VOB, MOV, WMV, RMVB and etc.) if you’ve decided to convert your files that are currently not compatible, with the Wondershare UniConverter (originally Wondershare Video Converter Ultimate). It supports up to 1000 different formats as well as the creation and burning of DVDs. It gets even better when you can also download your favorite videos or record your favorite TV shows from the popular online streaming site. 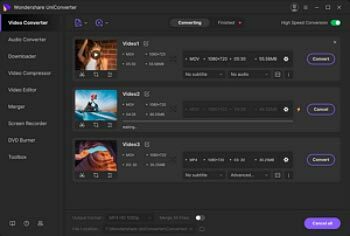 Even though it’s not difficult to come across a video converter right now, it’s quite a challenge to decide on the RIGHT one that’ll be able to satisfy your videos needs. Especially one that can convert up to 30X faster with lossless quality as well as a sleek yet user-friendly interface. 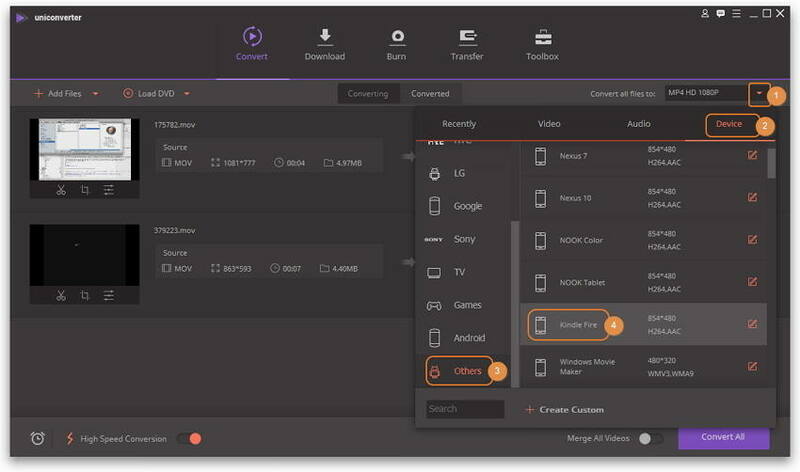 Rather than asking the user to go through all the hassle of having to input the video settings themselves, there’s built-in preset for your choice of device and model at your fingertips. Simply drag-and-drop your files onto the interface and then edit if you wish to (i.e. trim, crop, rotate and etc.) before selecting your output format. You can select Kindle Fire as the output format following the screenshot. Feel free to leave us a message or get in touch with our Support team for any other queries. We'll be more than happy to hear from you.